James E. Davis complains that Isaac Williams holds his two sons J.H. and C.W. Davis against his consent. Letter sent as above. Children released. Edward Hunt complains that Isaac Lewis of Somerset Co MD, holds his sons David and John against his consent. Letter sent as above. Case settled and children released. Eliza Norman complains that Samuel Trump of Worcester Co. Md. holds her sons Luke and Casper Nowman against her consent. Letter &c sent as above. Case settled and children released. Mary Jamison complains that Stephen Jackson holds her children James, Thomas & Martin Jamison against her consent. Letter sent to Stephen Jackson Elkton Cecil Co. Md. Case settled and children released. 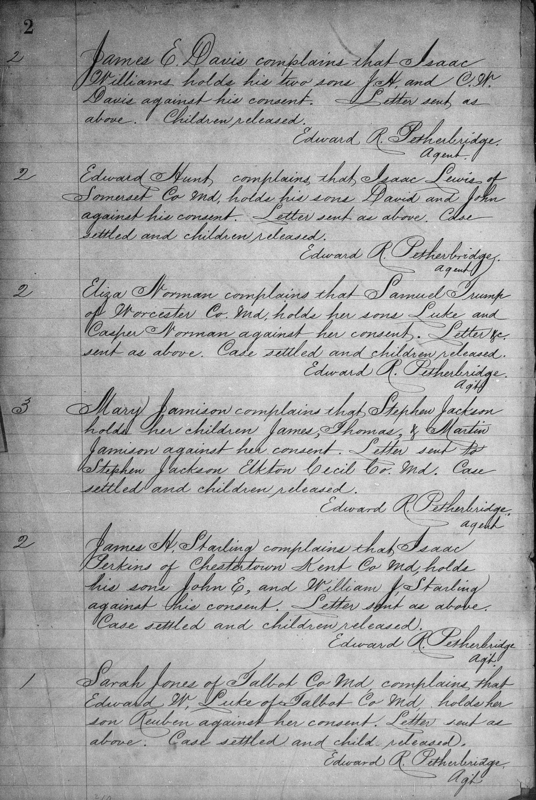 James H. Starling complains that Isaac Perkins of Chestertown Kent Co Md, holds his sons John E. and William J. Starling against his consent. Letter sent as above. Case settled and children released. Sarah Jones of Talbot Co Md, complains that Edward W. Luke of Talbot Co Md, holds her son Reubin against her consent. Letter sent as above. Case settled and child released. “Maryland and Delaware, Freedmen’s Bureau Field Office Records, 1865-1872,” images, FamilySearch (https://familysearch.org/pal:/MM9.3.1/TH-1961-27444-22091-25?cc=1989156&wc=9C3M-W3K:266115501,266128101 : accessed 27 December 2014), Assistant Commissioner > Roll 6, Register of complaints of illegal apprenticeships, vol (21), circa 1868 > image 5 of 15; citing NARA microfilm publication M1906, National Archives and Records Administration, Washington, D.C.